Reconciliation versus Resistance: Which will Win? After this year’s national election, a sizable portion of our population will feel devastated and perhaps even betrayed. When Kennedy defeated Nixon in 1960 (my earliest clear recollection) and in the years since, if your candidate lost there was always the realization that the sun would still rise, the country would somehow survive and that the system was stronger than an individual election cycle. The sense of loss ultimately faded. This time, this year feels different: some of our fellow citizens may conclude that something intrinsic to their personal freedom is at risk. Fueled by overheated and vitriolic online and over the air commentary, not to mention irresponsible campaign bluster, the losing side’s angst may merely manifest itself in rejection of further participation in our electoral process. Others from that side may feel compelled to take more drastic measures. 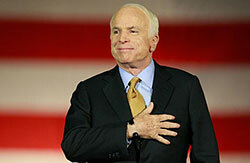 When Senator McCain gave his gracious concession speech after his 2008 defeat the TV cameras panned the audience. Not merely understandable disappointment, but something akin to rage seemed evident on many faces in that crowd. My impression is that night’s bitterness has only been reinforced as the rhetoric has escalated during this election cycle. As the chasm between opposing ideologies widens, this obvious and deepening rupture in our society may devolve into more serious threats to public safety. One of the most rewarding aspects of being an emergency manager is the absolute necessity of shedding personal political attitudes and biases when our fellow Americans are suffering: when a family is huddled on a roof during a flood or a wildfire threatens a home neither political beliefs nor resident status of those in harm’s way matters. They are just human beings in need. In such times, the best in our government and in our entire society shines through all the noise, silencing the drumbeats of partisanship (and bigotry) for a while, at least. It’s ok to distrust the government, accept its help when necessary, and having received that help go back to distrusting government once you are safe. This is the United States, after all. The election results could undermine even that sense of commonality. No matter who wins, the losing side may feel more alienated than ever before. Ever sharper divisions may be drawn, and that will have consequences for public safety, because distrust in our system breeds hopelessness and that, for some, validates a violent reaction. We had best discuss how to prepare and educate emergency managers and their public safety colleagues to cope with this expanding philosophical fracture in our society. The emergence of uncompromising perspectives could translate into a serious confrontation. We need to pay attention to this: it matters.